So month number seven is here! I thought that by month seven I'd had a nice little system down for getting monthly birthday posts like this done, but I don't. Welcome to motherhood...always changing, always learning. Compared to month one, there seem to be even more pictures, even more stories, and even more things to share about. So let's get this going. As you'll soon see from the many photos that follow in this post, Avery's little personality sure has been coming out this month as she's become more vocal and mobile! Happy seven months to me! Going for a stand up pose. She always has lots to say. Happy smiles for who? You guessed it...Daddy! Okay, I got a few smiles too. Now onto her stats for this month: 29 inches and 20lbs. Now if you are a loyal follower of my monthly Avery posts you might wonder why this is the same if not less (by height) than last month and that's because I think I've been doing it wrong. I think I've been stretching her feet out long and measuring all the way to her toes, instead of just to the bottom of her heel. So last month I had her at 30 inches and this month only at 29. I doubt she's shrinking, but I can't remember where I measured to last month on her feet, heels or toes? Boy this motherhood stuff sure scrambles your brain a bit time to time. ( : Anyways, to start doing it right from now on, I'm going with the bottom of the heel (as I did with this month) and we'll see where that gets us this next month. Now although her stats don't quite reflect it this month, Avery sure has been growing. 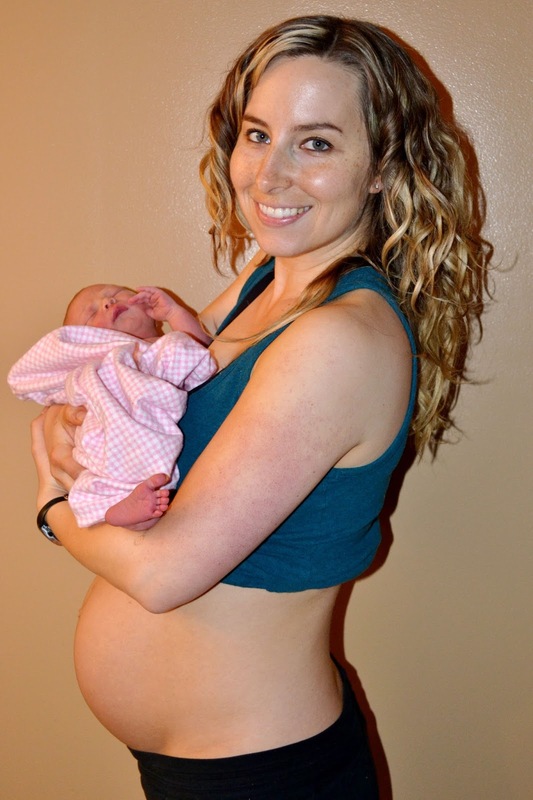 I did an update to a post I did several months back called, "Body After Birth" where I chronicalled what changes my body underwent from the day I gave birth to 6 weeks postpartum. Well, now I'm back and posting about additional changes that have taken place from 6 weeks to 6 months out. Check out the pic below, I can't believe how much Avery's grown! Click here to see the update to this post. Now time to see what we've been up to over the past month. Towards the end of October, I thought it would be fun to re-create a photo op from our past. 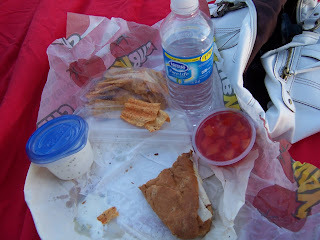 Five years ago to the date, Brandon and I got engaged during a picnic at one of our favorite local lakes. Granted, this time around things didn't quite go according to plan since it was probably 20 degrees cooler than it was five years ago, brr.. we ate our food fast! Also, trying to coordinate the timer on my camera with a baby involved was one tricky task! Somehow we made it work and we'll have some funny memories to think back in five more years. October 28, 2011...with Avery on board now! 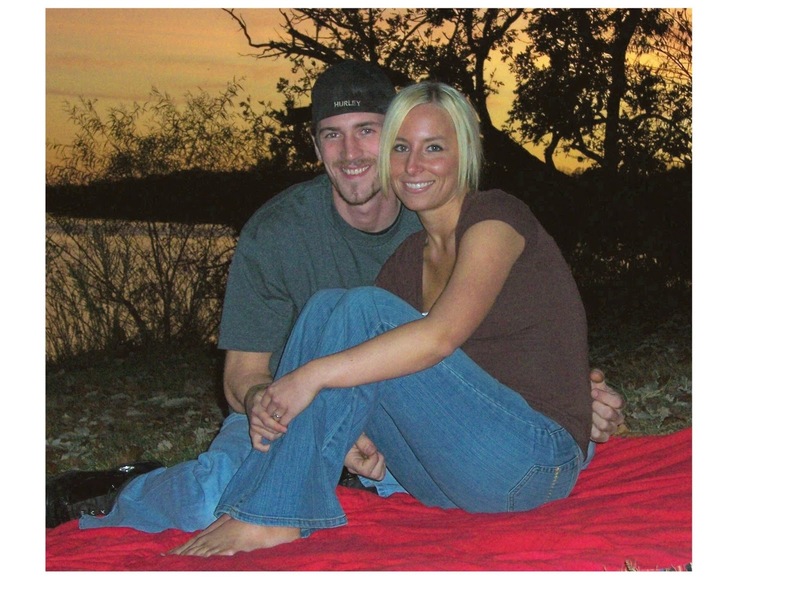 5 years earlier...just minutes after we got engaged! Now smiling with my girl. about back in this post. Sunchips, and fat free ranch dressing. Our company has changed too. Someone wants some noodles. Still a pretty sunset though. Another fun thing we did this month was to get all dressed up (we are pretty casual people if you can't tell) and go to a friend of our family's wedding...Avery included. Always happy in Daddy's arms. Baby-Led Solids Update: Solid foods for Avery continue this month with the baby-led weaning/solids approach I blogged about last month and we are all loving it. I can't imagine giving her solid foods any other way (baby food, spoon-fed, etc.). This method is so stress free, prep free, and fun! Okay it is a bit messy, but I bet spoon-fed babies get a bit messy too...they're babies, what do you expect! She seems to really be learning a lot too and her little fingers are getting much stronger and more coordinated. Where last month she was just exploring the food ("Hmmm a banana, that's a cool toy.") this month she has more motivation to get the food and put it in her mouth ("Banana, you're mine!"). "I'm super excited for solid foods guys!" Now as I mentioned last month, with the baby-led solids approach, the solid food does not take the place of breast milk, I continue to nurse Avery whenever she wants, but instead I provide her with opportunities to explore and eat the solid foods. In fact sometimes I swear she nurses more now that she has solid food (at least at night) than she did before! On another fun note, her poop has started to change as well. It seems like as her coordination improved and more food actually made it into her mouth, that when the consistency of her poop changed. Sorry if this TMI for you, but some mamas might appreciate it. Gone are the days of sweet smelling, liquid BMs from breast milk, now we've got thicker, slightly more pungent bowel movements with little bits of food, which baby-led solid books all say is perfectly fine and to be expected. Now is the time that I am super grateful for the cloth diapering service I mentioned in this post! we're good to go. Here was a spaghetti dinner one night. cilantro...a few fresh green peppers too. of food while eating (like the green pepper here). Tofu is another new favorite! push it right up to the table. Blowing raspberries, a favorite thing this month. hold the glass herself or play with the water. a wide shot glass- lol. on things and balance on them. Always loves crawling towards the light. of it...in this case it was Grandma's legs! bowl. Look at her, mesmerized! "How about now, still watching?" Climbing is pretty fun too! The wheels are turning...check out what my sneaky little girl is up to now: undoing the Velcro on her cloth diapers! Oh no, here comes the hand. Now for a few extra fun ones of my girl and I on my grandparent's porch swing. nothing quite compares to the joy of being a mom. See you all at next month as we prepare to celebrate the holiday season..."Avery Style!"